Most people drink tea about 8 times a day. I drink it about 8 times a year. If it's cold outside people say 'have a cup of cha it'll warm you up'. This I understand but the same people, on a hot summers day, say 'have a brew it'll cool you down'. Well which is it? Does it cool me down or warm me up? Although we all know that they already have made their mind up. It's both apparently, meaning they can squeeze even more cups of tea into the day than is humanly possible. As a side note I would like to point out that my comic doesnt make sense. 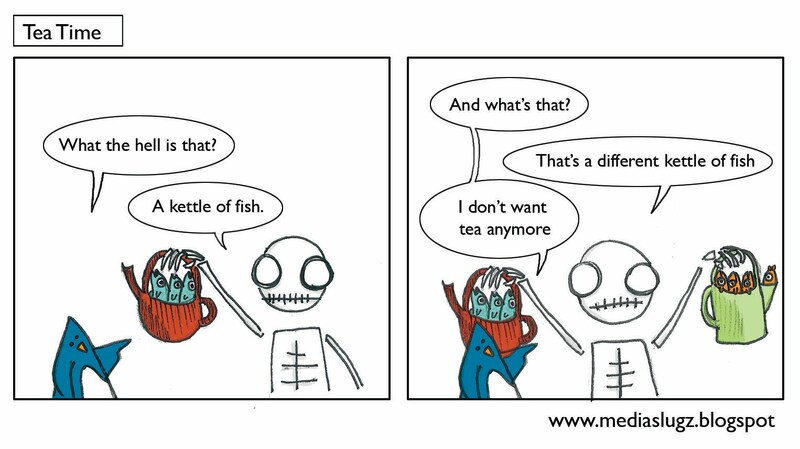 Not because it has a skeleton talking to a penguin but because penguins love fish. I would have thought that he would have gladly accepted either kettle of fish. Nom.